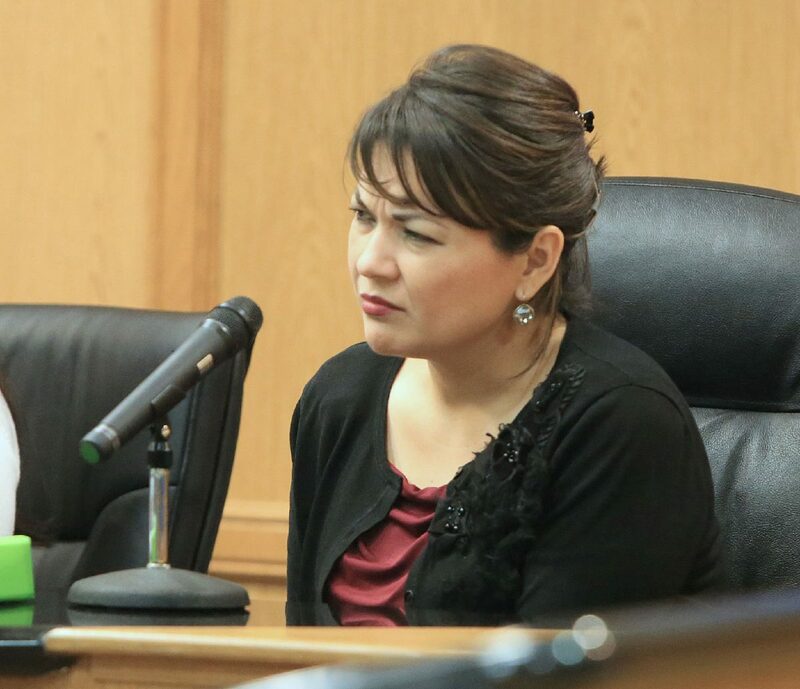 EDINBURG — Fearing that the jury may be growing fatigued after hours of witness testimony, state District Judge Noe Gonzalez raised concern Thursday with the notably slow pace of the Monica Melissa Patterson capital murder trial. 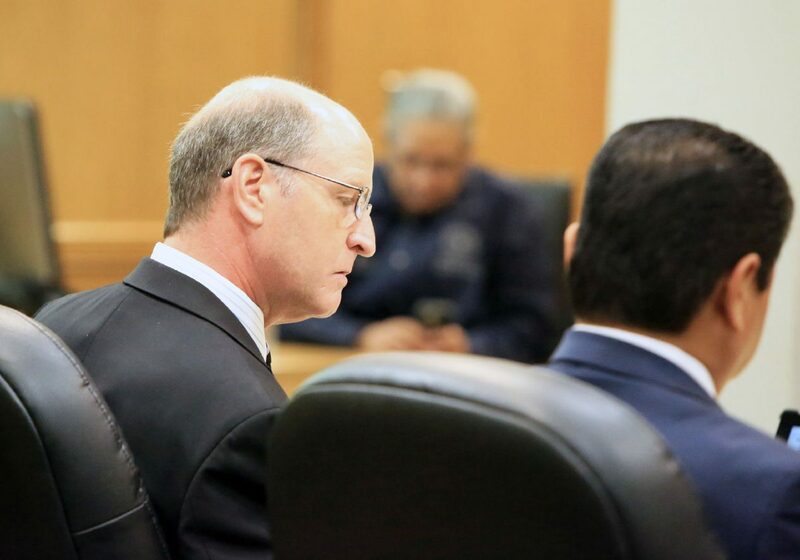 Nearing the end of its second week and with likely a few more still to go, day nine of the trial began Thursday morning with Raquel Ybarra, a medical social worker, taking the stand for nearly four hours. 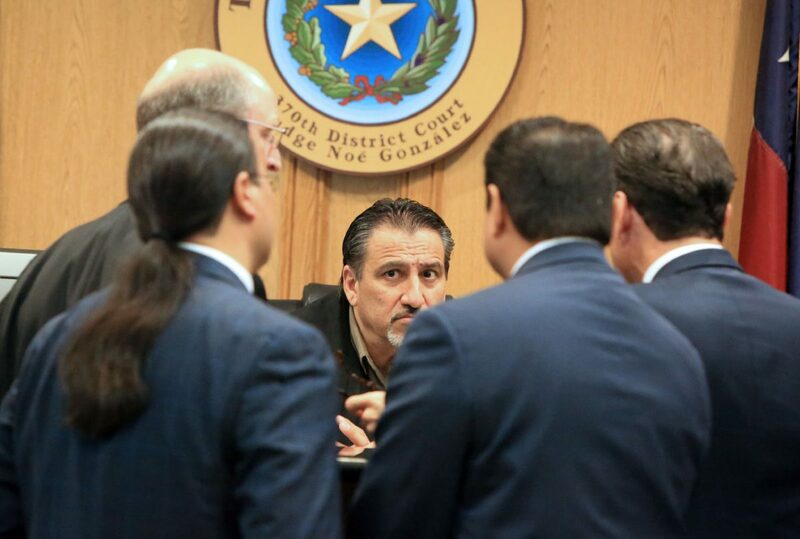 Just before 3 p.m., while Ybarra was still undergoing cross-examination, Gonzalez finally reminded the attorneys — namely defense attorney Ricardo “Rick” Salinas — that they needed to be mindful of the jurors’ time. 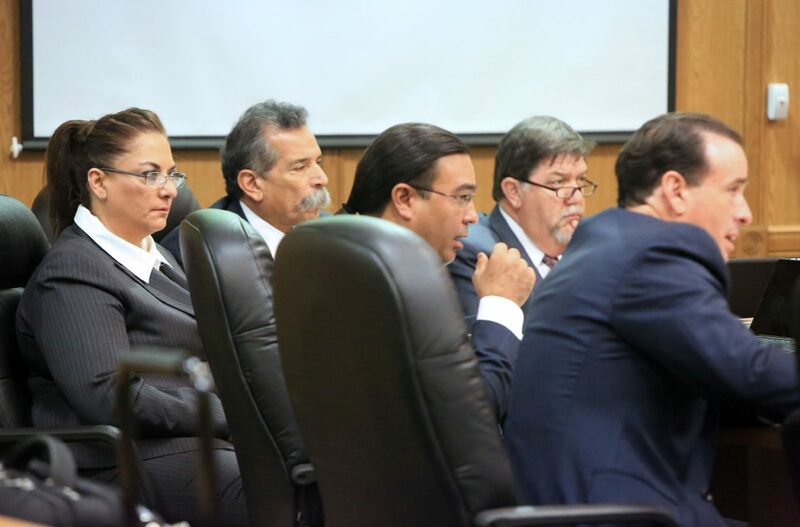 District Judge Noe Gonzalez talks with lawyers from the defense and the prosecution during the Monica Melissa Patterson capital murder trial in the 370th state District Court at the Hidalgo County Courthouse on Oct. 5, 2017 in Edinburg. 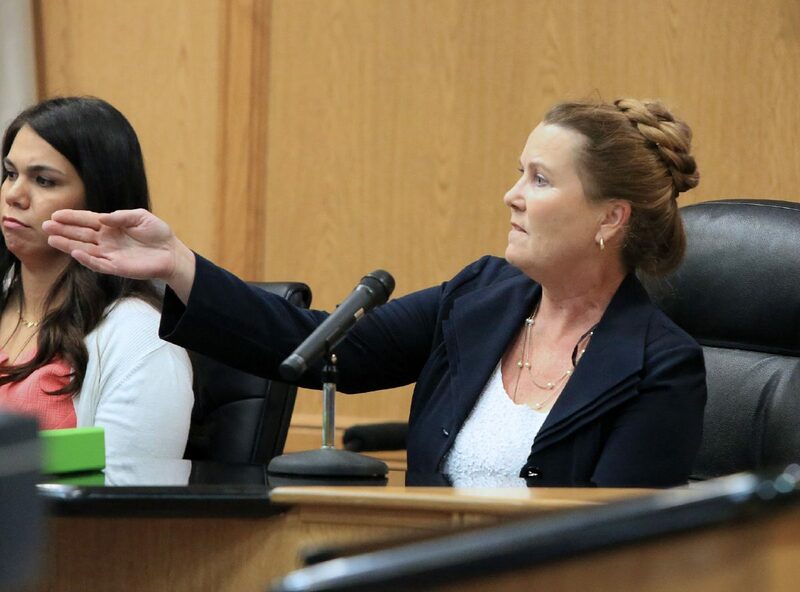 Witness Kathleen Redfern points to Monica Melissa Patterson across the courtroom during during questioning in Patterson's capital murder trial in the 370th state District Court at the Hidalgo County Courthouse on Oct. 5, 2017, in Edinburg. Hidalgo County Assistant District Attorney Cregg Thompson looks over evidence during the questioning of Raquel Ybarra on the stand during the Monica Melissa Patterson capital murder trial in the 370th state District Court at the Hidalgo County Courthouse on Oct. 5, 2017 in Edinburg. Witness Raquel Ybarra listens to questioning from defense attorney Ricardo “Rick” Salinas during the Monica Melissa Patterson capital murder trial in the 370th state District Court at the Hidalgo County Courthouse on Oct. 5, 2017 in Edinburg. Patterson is alleged to have killed Martin Knell Sr. in January 2015 in order to gain control of his estate, and also faces three additional charges of theft and misapplication of a fiduciary. Ybarra testified that Knell appeared visibly angry during a Nov. 24, 2014, visit to Knell’s residence. The social worker was there to provide bereavement counseling following the October 2014 death of his wife. According to Ybarra’s testimony, Knell was angry about Patterson making herself payee upon death to his stocks without his knowledge. Knell’s wife, Thelma, was a patient at Comfort House, the McAllen nonprofit hospice center where Patterson served as administrator from early 2014 until her August 2015 arrest. Knell told Ybarra he had given Patterson the account information for the stocks since he did not want his son to access his finances. But he subsequently accused Patterson of conspiring with his son to take his money, telling Ybarra he wanted Patterson to return $300,000 in cash he had asked her to hold onto for him. Ybarra testified that Knell also wanted Patterson to remove her name from his stocks. Knell wanted Ybarra to stay while he questioned Patterson — who arrived during the house call — about his finances. But Patterson told Knell she “couldn’t discuss privileged information” in front of the social worker. Ybarra left, telling jurors she felt “uneasy,” which prompted her to drive by the 96-year-old’s residence two hours later, only to see Patterson’s car still there. Fearing that Knell was being financially exploited by Patterson, she filed reports with Adult Protective Services and local law enforcement. When she returned to Knell’s house two days later on Nov. 26, 2014, Knell told her it had all been a misunderstanding and Patterson had agreed to remove her name and deposit the money into his bank account. Witness testimony over the course of the trial’s past nine days, however, has revealed that this did not occur. Salinas’ cross-examination of Ybarra’s testimony then focused on a letter Knell purportedly sent to her employer, Great Valley Hospice Alliance, with regard to a visit to Knell’s home by another alliance employee, Francisco “Frank” Perez. Perez testified last week that he never visited Knell’s residence on Dec. 11, 2014, as stated in the letter, and the prosecution showed jurors Perez’s travel log from that day, which did not list such a trip. Salinas also said that the defense’s cross-examination was taking so long because the prosecution would not give them the names of the witnesses they planned to call each day in advance. “They won’t tell us who they are going to call next!” Salinas exclaimed, arguing that the defense needed time to find and review exhibits in order to avoid recalling witnesses, this despite the four-person defense team having two assistants, who spend much of the trial pulling documents. In addition to Ybarra, the prosecution called Kathleen Redfern to the stand, a director at Greater Valley Hospice. Redfern told jurors that Patterson called her on the September 2014 evening Knell’s wife was admitted to Comfort House demanding that Redfern send a hospice nurse to the facility immediately, this to transfer Thelma from the stretcher, where she laid for “many hours,” to her bed. Although Redfern said it was Comfort House policy not to “touch a patient” until hospice personnel arrives, she said it was highly unusual for a patient to be admitted on a weekend, specifically late at night. Redfern also told jurors that after Ybarra informed her of what she had seen at the November 2014 house visit where Patterson was present, she contacted multiple agencies — including the Texas Department of Aging and Disability Services, the Office of the Attorney General of Texas and the Better Business Bureau — to express her concern that Patterson was taking advantage of and financially exploiting Knell. Before Gonzalez dismissed jurors for the night, the judge took up an issue the defense had with a letter Redfern sent anonymously to Comfort House board members, KRGV Channel 5 News, CBS 4 (KGBT-TV) and KVEO – TV News Channel 23 expressing her concerns and asking them to look into Patterson. Gonzalez, however, said the letter would be taken under advisement, which doesn’t necessarily mean it will be omitted as evidence so long as the prosecution can establish a legal basis. The letter will not be shown to jurors until that time. Redfern will return to the stand Friday to continue her testimony. It remains unknown how many more witnesses the prosecution will call before resting their case. This story was updated to reflect that Redfern’s confidential letter will not be shown to jurors at this time. The prosecution’s plans with regard to the number of witnesses left to call were also incorrect. It’s not known how many more witnesses will take the stand before the prosecution will rest their case.